Oh the south. Here, in America, there are all kinds of connotations related to the south. In various communities in different states of America, there are connotations in relation to the south-side of whatever community someone lives in. Many of these connotations are not good and can be damaging stereotypes. Let us put all those out of our minds and see what the Bible has to say about the south in Biblical times. Before we go there, let us have a quick review of the tribes that camp on the east-side and the south-side of the total formation. I refreshed our memories about the eastern camping tribes because I just found something interesting that I had not paid attention to before. We have not discussed the Levites yet but they are the tribe responsible for the Tabernacle and the priesthood of the children of Israel (more on that later). They camped in the middle of all the other tribes. 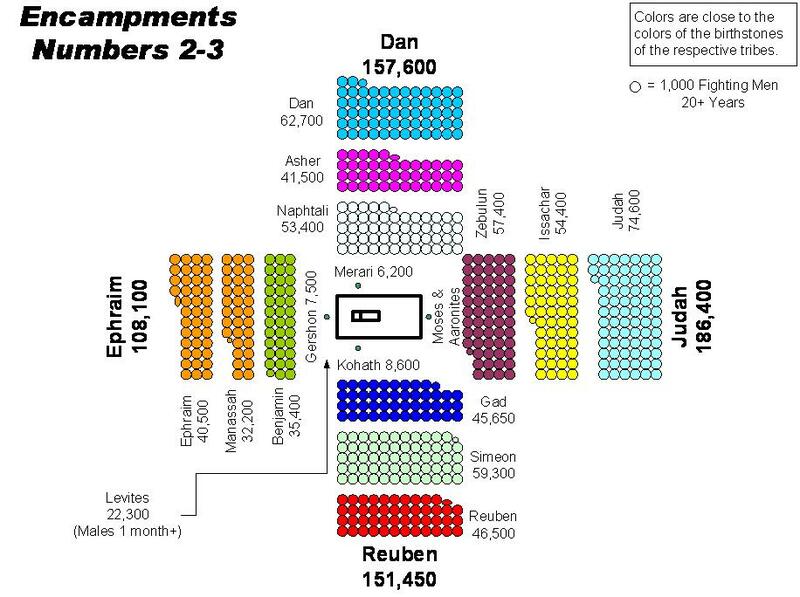 There is something to be noted regarding how the tribes broke camp in relation to the moving of the Tabernacle. Numbers 10:14-21 – The standard of the camp of the children of Judah set out first according to their armies; over their army was Nahshon the son of Amminadab. 15 Over the army of the tribe of the children of Issachar was Nethanel the son of Zuar. 16 And over the army of the tribe of the children of Zebulun was Eliab the son of Helon. In other words, the east broke camp first then those of the Levites responsible for the tent of meeting broke. Next, the south broke camp and those Levites responsible for the Holy things inside the tent of meeting broke. The last tribe of the east was Zebulun (habitation). The first tribe of the south was Reuben (behold, a son). The entirety of the Tabernacle is a representation of Jesus and His Body (us). It is a habitation of and for the people of God (again, us). To me, it is interesting that the last tribe before the tent of meeting (tabernacle) moved means ‘habitation’ and the tribe that moved after it means ‘behold, a son’. Jesus is our dwelling place and we can see Him better when we allow Him to abide in us and we allow ourselves to abide in Him. From the perspective of Jerusalem, Egypt is to the south. Egypt represents both something positive and something negative. The negative representation is the oppression of the Israelites. The positive side is that God showed up multiple times to deliver His people from famine, oppression, and death. I admonish us all to read what Stephen said before he was stoned to death in Acts 7. It gives a thorough account of all the trials as well as the accounts of how God saved His people in this southern land. Another note about the south is it is related to the desert. The south wind blows from the desert thus brings heat. Luke 12:55 – And when you see the south wind blow, you say, ‘There will be hot weather’; and there is. Moses was tested and grew to hear and obey the Lord in the desert; the Israelites were tested and grew to hear and obey the Lord in the desert (those that chose to and survived because of it); John the Baptist lived, heard, and obeyed the Lord in the desert; Jesus was tempted in the desert. The desert is the wilderness. The desert is in the south. It is in our personal wilderness that we learn to see our Lord (Reuben-behold, a son), we learn to hear and obey our Lord (Simeon-hear with acceptance), and we learn how truly blessed we are (Gad-fortune). We have trials because we are learning to deny our flesh in our spiritual walk to be more like Jesus. When we are tried in the fire; we become overcomers. Revelation 3:18-21 – I counsel you to buy from Me gold refined in the fire, that you may be rich; and white garments, that you may be clothed, that the shame of your nakedness may not be revealed; and anoint your eyes with eye salve, that you may see. 19 As many as I love, I rebuke and chasten. Therefore be zealous and repent. 20 Behold, I stand at the door and knock. If anyone hears My voice and opens the door, I will come in to him and dine with him, and he with Me. 21 To him who overcomes I will grant to sit with Me on My throne, as I also overcame and sat down with My Father on His throne. When the south wind blows and brings the heat, we should remember that our dwelling place (the Tabernacle-Jesus Christ Himself) has already gone before us. As we break from the south, as we begin to walk out our salvation and deny those things that are not of God, the Holy things of the Tabernacle come after and become a part of us. I pray these things are beginning to fill us and we are beginning to take hold of what is being given in this series. We are the vessels God Almighty uses to advance His Kingdom here “on earth as it is in a Heaven”. I pray we are seeing and understanding that God our Father does nothing on accident; everything He does is with a purpose. The things of the enemy causes the downfalls we experience. We make decisions daily whether to agree and trust the enemy or agree and trust God. We may not always get it right but by His Grace are we saved and therefore, by the Grace of God go I. Whenever we find ourselves in the heat of the desert or overcome by the heat of the desert wind that comes from the south, we should pause until we see The Son, hear what He is saying by the Spirit of the Living God, and know that we are blessed by Him (fortunate). Selah.